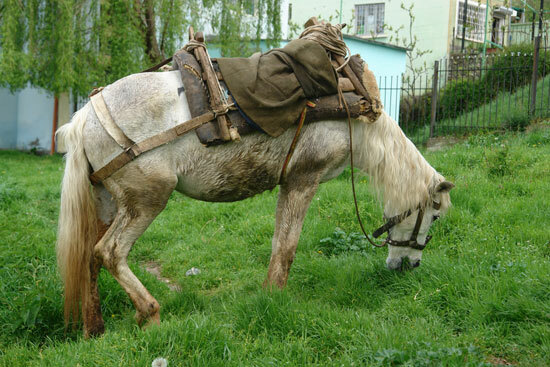 Albanian Horses originated in the 5th century, during the Ottoman Empire. They are a small horse (12-13 hands high) and belong to the Balkan group. Native Albanian horses came from either the Mountain or Myzeqea plains of Albania. Albanian Horses were originally thought to have been created by breeding Arabian horses with the local Albanian horses, which were likely combined with Tarpan, Turkmenian, or Mongolian stock breeds. Albanaian horses typically have coats of Bay, Black, Chestnut and Gray. They are high energy horses, and have a strong endurance. They are agile, sure-footed, disease resistant, and can function in difficult terrain. In the past these horses were used more for transport and riding than for agricultural purposes. Since the 1990’s Albanaian horses have been crossed with purebred Arabs, Nonius, and Haflinger breeds to increase their size for better agricultural work and to increase their population. Several improved breed types are emerging from these efforts.